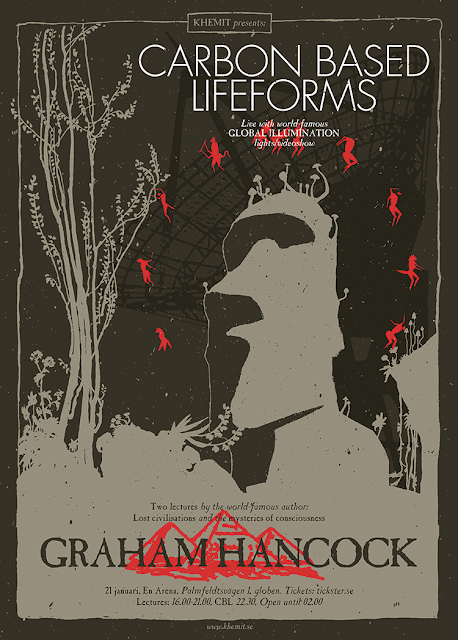 January 21 - a speaking event featuring bestselling British author Graham Hancock, followed by Carbon Based Lifeforms live in concert. GRAHAM HANCOCK - 16:00 - 21:00, with a pause between the two talks. January 21; En Arena - Stockholm, Sweden. Palmfeldtsvägen 1, subway Globen. Note that the presentation and concert are two separate events, those who wish to attend both can purchase the combination ticket. Carbon Based Lifeforms (CBL) consists of Johannes Hedberg and Daniel Segerstad (formerly Ringström) - both of them born in 1976 and based in Gothenburg on the west coast of Sweden. They first met when they were 15 and are still, amazingly, working happily together 25 years later. The music of Johannes and Daniel aims to combine earth and space. Using the fusion of nature and technology as their main inspiration, they seek to portray both the positive and negative effects that this union can lead to - including the detrimental impact that modern innovation can have on the environment. Through this conceptual synergy, their creations often seem to reflect the natural landscape of their home soil. Listen to “Photosynthesis” on the “World of Sleepers” album, and you’ll find yourself in genuine concern for the forests. Then check the source of the quote sampled in the track and you’ll find that this was probably their intention. A much-loved live band, CBL rarely perform besides special events and bigger international festivals. The last time they appeared in Stockholm was the much spoken-about two nights of sold out performances at Cosmonova, the IMAX-theatre in Stockholm's Museum of Natural History. This time, they will bring along a special visual and lights show by Global Illuminations - exclusive for this event, so prepare for a feast that caters to the eyes as well as the ears and mind. The British bestselling author will give two separate 90 minute lectures, with an intermission in-between. An recent interview with Hancock can be read here. Is the house of history built on foundations of sand? Disturbing new evidence recently published in leading scientific journals confirms that multiple fragments of a disintegrating giant comet struck the earth in a series of cataclysmic bombardments that began 12,800 years ago and continued until 11,600 years ago. The impacts brought the last Ice Age to an end, caused worldwide extinctions of animal species and changed the face of the Earth. Established theories about the emergence of civilization cite the invention of agriculture and monumental architecture at precisely 11,600 years ago – immediately after this sustained cataclysmic episode – yet the cataclysm itself is not taken into account by archaeologists seeking to explain the origins of civilization. What the record attests to, Graham Hancock argues, is not the sudden "invention" of new and previously unknown skills, but a transfer of technology to hunter-gatherers from the survivors of a more advanced "lost" civilization. These survivors were remembered by later cultures under such names such as ‘the Sages’, ‘the Magicians’, ‘the Shining Ones’, and ‘the Mystery Teachers of Heaven’. They travelled the world in their great ships doing all in their power to keep the spark of civilization burning. They settled at key locations where new archeological discoveries are now being unearthed – Gobekli Tepe in Turkey, Baalbek in the Lebanon, Giza in Egypt, ancient Sumer, Mexico, Peru and across the Pacific where a huge pyramid has recently been discovered in Indonesia. Everywhere they went these ‘Magicians of the Gods’ brought with them the memory of a time when mankind had fallen out of harmony with the universe and paid a heavy price -- a memory of immense significance to the predicament of our own society today. In this talk which touches on Gnosticism, good and evil, the Great Pyramid, the mystery of death, altered states of consciousness and parallel dimensions, Graham Hancock argues that our society is over-monopolistically dependent on the alert problem solving state of consciousness and ignores, marginalises and demonises the contribution of non-ordinary states of consciousness at its peril. For example, we run the risk of prison, confiscation of our property and public humiliation if we make use of time-honoured sacred plants to explore our own consciousness. Yet surely the exploration and expansion of the miracle of consciousness is the essence of what it is to be human? And in what sense can we claim to be free when we, as adults, are forbidden to make sovereign decisions regarding our own consciousness which is, after all, the most intimate, the most precious, and the most sapient part of ourselves? Graham’s research into the ancient Egyptian books of the dead, and into shamanism, Upper Palaeolithic cave art, ayahuasca, and hallucinogenics have led to his hypothesis that experiences in induced altered states of consciousness have played a fundamental and much misunderstood role in the story of humanity. Recent research has produced intriguing scientific evidence, which this talk will review, that such experiences may even allow interaction with other levels of reality not normally accessible to our senses and thus may hold the key to the future of our species. Author of the major international non-fiction bestsellers The Sign and the Seal, Fingerprints of the Gods, The Message of the Sphinx, Heaven’s Mirror, Underworld and Supernatural, and of the epic adventure novels Entangled and War God. Graham's books have sold more than seven million copies worldwide and have been translated into thirty languages. His public lectures, radio and TV appearances, including two major TV series, Quest For The Lost Civilisation and Flooded Kingdoms of the Ice Age, as well as his strong presence on the internet, have put his ideas before audiences of tens of millions. He has become recognised as an unconventional thinker who raises resonant questions about humanity’s past and about our present predicament. In February 2016 Hancock was voted No 14 in the Watkins list of “The 100 Most Spiritually Influential Living People”: http://www.watkinsmagazine.com/watkins-spiritual-100-list-2016. Hancock's new book, Magicians of the Gods, was published in the UK on 10 September 2015 and in the US on 10 November. A speaking event featuring bestselling British author Graham Hancock, followed by Carbon Based Lifeforms live in concert.